Sis. Alvateen Taylor, 77, departed this life on Monday October 22, 2018 at her home in Gresham. She was the sister of Cecil Taylor and Curtis Taylor. You may visit the family at 7655 Bay Rd. Gresham. Funeral services are scheduled to be held at the Bethel AME Church Saturday October 27, 2018 at 12:00 noon. She will be laid to rest in the Old Neck Cemetery, Britton's Neck. Alvateen Taylor, aﬀectionally known as “ Teen” was born June 30,1941, to the late Mr. Sam and Dessie Taylor. 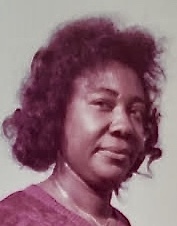 She departed this life on Monday, October 22, 2018, in Britton’s Neck, South Carolina. She is a graduate of Bethel High School. Alvateen worked tirelessly on the family farm and as a great caregiver to all of her nieces and nephews. She was a member of Bethel A.M.E. Church, where she was baptized at an early age. To anyone who came in contact with Teen, she would greet you with her warm trademark smile and say, “Hi or Hello.” Teen was never one who would hold anything back. She would tell you right from wrong, especially when it aﬀected her. She was preceded in death by two sisters, Arnether, Jaunita, andthree brothers, Robert, Frank, and Levern. Alvateen leaves to cherish fond memories: two brothers; Cecil (Linda) Taylor, Curtis Lee (Janie) Taylor of Britton’s Neck, SC, three sister-in-laws; Lethea Taylor, Esterlene Taylor of Britton’s Neck, Barbara Taylor-Best of Mullins, SC, several nieces, a host of nephews, cousins and loyal friends.